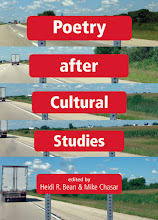 Poetry & Popular Culture came across this goody the other day and initially planned to save it for later. 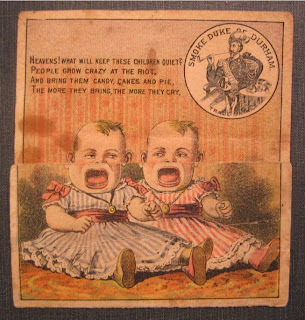 Impatience has gotten the best of us, though, and so here it is—a 19th-century advertising trade card for Duke's Durham tobacco that features two of the scariest babies we've ever seen. 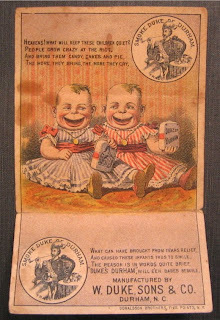 One of the most popular forms of advertising in the Gilded Age, trade cards advertised everything from soap and coffee to sewing machines and patent medicines—Harvard's Baker Library has a collection of 8,000 of them which you can search here if you're looking for something special—and were collected, individually and in series, in the scrapbooks and albums which Ellen Gruber Garvey studies in Chapter One of The Adman in the Parlor: Magazines and the Gendering of Consumer Culture 1880s to 1910s (1996). If you know anything about baseball cards, then you know they, too, like the card pictured here, were also used to advertise tobacco and, in some cases—as with the famous 1910 T206 Honus Wanger—are worth a lot of dough today. Heavens! What will keep these children quiet? The more they bring, the more they cry. "DUKE'S DURHAM," will e'en babes beguile. Over the years, of course, big tobacco has made numerous claims about the restorative, health or beauty-inducing qualities of their product, but P&PC has never seen tobacco producers go so far as to make a play for the nookie market—suggesting chew tobacco as the perfect chew toy to keep your toddler from, well, bawling its lungs out.